Is Transparency The Music Industry's Next Battle? : The Record A report on the music industry from Berklee College of Music offers recommendations for ensuring that royalties make it to their rightful owners. Taylor Swift performs in Dublin. 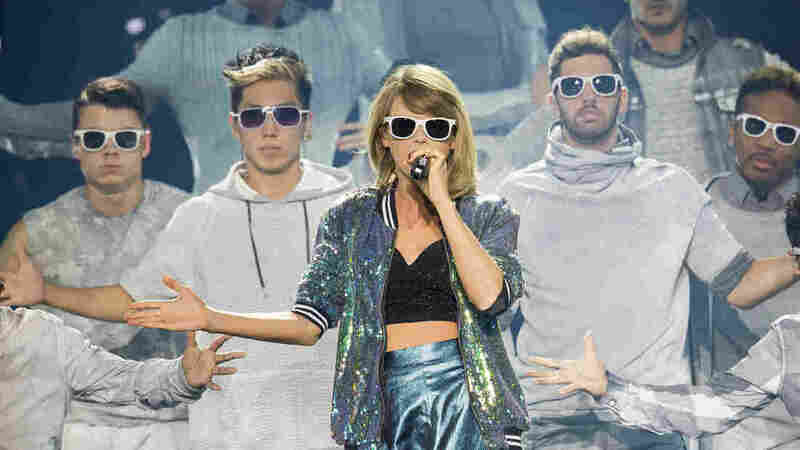 In June, Swift protested Apple's payments to musicians in its new Apple Music streaming service. The issue of how much musicians theoretically earn from their work has moved out of the trade press and into social media's trending topics recently, whether that's Taylor Swift demonstrating her clout via a successful protest of Apple Music or Jay Z's Tidal promising artists higher royalty rates than other streaming services. In the background of these debates is the question of whether songwriters and performers are actually getting all the money they're owed. A new report released today by the Berklee College of Music's Institute for Creative Entrepreneurship details what it repeatedly calls a "lack of transparency" in the music business. Titled "Transparency and Money Flows," the 28-page report also gives recommendations that highlight the labyrinthine complexity of the current system. The output of a year-long study, the report cites estimates "that anywhere from 20-50 percent of music payments don't make it to their rightful owners." Proposed fixes include better behind-the-scenes technologies, a "Creator's Bill of Rights," a "Fair Music" seal and education campaigns. Those approximated percentages for music payouts lost in limbo are "based on multiple conversations with many different folks involved in payments," acknowledges Allen Bargfrede, an associate professor at Berklee who spearheaded the report. "I personally believe the number is closer to 20%, especially in Europe and North America, but probably can be as high as 50% when you start to look at streaming payments in other languages that have different character sets." The reasons so much revenue might fail to trickle down are as baroquely varied as the services and royalty types that generate music income in the first place. Musicians (or anyone to whom they sell their rights) can earn fractions of pennies or thousands of dollars from streaming services, from licenses for films, TV or commercials and from whatever lawyers deem "public performances" of their works, all without anyone ever buying a CD or mp3. A growing layer of middlemen that collect the money and theoretically pass it on to the rights holders presents another opportunity for some of that revenue to lose its way. One focus of the report is the so-called "black box," a phrase that refers to where money ends up when, for instance, royalty revenue from a stream can't be linked back to a songwriter. Or take "breakage," the difference between the advance a streaming service pays to a label and the royalties. If each streaming service were to pay each of the three major labels the $42.5 million advance for which Sony Music was eligible under a leaked Spotify contract published by The Verge this past spring, the potential pool of breakage revenues to labels would total hundreds of million dollars, the report says. Since the leak, the major labels have all said they share advance payments with artists. Another source of funds for the black box stems from differences in international copyright law, which results in license fees being collected abroad for what's known as the "performance" of U.S. sound recordings. According to the report, this revenue usually ends up with foreign sources, which pass the money along to local artists. "The biggest message out of the report is just the lack of technology adoption for the back end of the music industry," Berklee's Bargfrede says. "Streaming is now becoming the dominant method of music consumption. We need to figure out how to work with the streaming services in a way that makes sense to creators." More specifically, the report calls for an industry-standard format for up-to-date information about the various types of music revenues, so artists could in effect monitor their royalties online the way consumers track their bank accounts. The authors also propose creating "a decentralized, feasible" database of global copyright ownership details. The "Creator's Bill of Rights" would lay out a set of foundational principles for artists, from the right to be fairly compensated to the right to know which parties are taking a cut out of their payments streams. The "Fair Music" certification would allow digital services and labels to show they meet certain standards, similar to fair-trade coffee or organic vegetables. Beyond that, the Berklee researchers suggest lobbying Congress to enact a sweeping overhaul of the music copyright system proposed earlier this year by the U.S. Copyright Office. Finally, the report urges education programs to inform musicians about these issues affecting their revenue streams. The recommendations arrive as the issue of transparency in the music industry has been increasingly drawing more attention. A recent Financial Times op-ed suggested Swift should use her industry leverage to push for "a baseline set of contractual terms for digital, backed by more transparency about who is paying what to whom." Bringing further scrutiny to the issue was a June lawsuit by a group of American Idol winners that includes Kelly Clarkson and Carrie Underwood, claiming Sony's deal with Spotify cheats artists, given the label's ownership stake in the streaming service. Also significantly, Kobalt Music Group — a company that tracks and collects royalties — was the subject of a glowing May cover story in Wired UK featuring Skrillex. Kobalt is an underwriter of Berklee's Rethink Music program, of which this report is a part. Bargfrede says the work remains objective. Some industry observers agree that transparency is a problem for the music industry, though not all fully support the report's proposed solutions. Transparency is "the next big fight," says Casey Rae, CEO of the artists' advocacy nonprofit Future of Music Coalition, in an email. "The current environment has too many 'black boxes,'" he explains. "It's simply too easy for big companies to sit on money because they can't find out who to pay, or don't care to know. It's time to demand more accountability and transparency, and artists can play a crucial role in that push." Mark Mulligan, co-founder of digital-music market research firm MiDiA Research, says that while transparency is "certainly important," increasing it isn't going to fundamentally change the state of the industry. "That's essentially putting on a different coat of paint," he tells NPR. "It's still the same engine." To Mulligan, the biggest shift in the industry remains the transition from an "ownership model" to a "rental model," and the differing payout methods that entails. Jeff Price, founder of Tunecore and CEO of Audiam, a company that helps track down royalties from digital services, says between 15 percent and 30 percent of tracks on streaming services globally go unmatched with a songwriter. He says Audiam has collected more than $600,000 in the past 12 months from streaming services in so-called mechanical royalties for its client list, which includes the publishing catalogues of Metallica, Red Hot Chili Peppers and Jason Mraz. More than 40% of that revenue, which is only from U.S. streams, predates the launch of his current business. "For every single client we represent we have discovered they are just not getting paid for most recordings of their songs," Price says. Price lays much of the blame at the feet at what's known as a "compulsory license." That's the system allowing any musician to copy another's song without asking permission, so long as she pays a federally mandated fee. It's a system that dates to a 1908 Supreme Court decision that also gave rise to the idea of "mechanical" royalties, which apply to all mechanical reproductions of songs; the machines in question, back then, were player pianos. Price also expresses skepticism about the report's proposal of a global rights database. "Do you think Sony or Warner or even the kid down the street would want the condition of being paid to be some third-party database?" he asks. "Abso-f******-lutely not. I would never want that. I would want to go directly to the place that owes me money and tell the my name." The Recording Industry Association of America (RIAA) declined to comment on the recommendations without seeing the full report. "We support efforts to ensure all music creators are paid fairly and efficiently for their work, and we look forward to reading the report," says RIAA spokesperson Cara Duckworth in an email response. The American Association of Independent Music (A2IM), which represents independent labels, welcomes the discussion. "A2IM is extremely supportive of all industry efforts that would result in greater accuracy in reporting on intellectual property usage and the resulting revenue streams for creators," says Molly Neuman, acting president of A2IM, in an emailed statement. "The independent label community currently represents 35.1% of market share and we believe that with more accurate reporting, that share would be significantly larger. "We look forward to working with our industry colleagues on efforts to adopt practices to ensure all rights holders are paid precisely what they are due." "Transparency is paramount right now," Swank tells NPR. "Artists want to be compensated fairly for their work and their art, but I think the communication is really important to artists, and making sure that they get their statements every six months. They like to work with us because they know someone's actually going to respond to their emails." That said, while Swank doesn't oppose the idea of some industry-wide standards around payouts, he says the accounting on digital streams might take more time than the "Creator's Bill of Rights" would allow. And he's similarly ambivalent about the idea of a "Fair Music" seal. "I like that, but honestly think that labels' reputations should be able to bear them out without having that official certification," he says. "It feels weird to have to have some kind of certified thing to prove that you're not f****** over your artists." As for streaming services, Spotify tells NPR it's focused on transparency, too. "We're big believers in transparency and think it's key to building a new music economy that pays artists and songwriters fairly," says Jonathan Prince, global head of public policy and communications at Spotify, in an emailed statement. "We're committed to working with everyone in the business to increase transparency because it will only work if everyone in the value chain — from creators to rights holders to platforms and distributors — does it together." Artists, fans, labels, streaming services and others with a stake in the music industry's future will have more chances to weigh in on the report's proposals. Berklee's Rethink Music initiative has scheduled a public event on the subject in Boston on October 2. "We welcome anyone to please participate," Bargfrede says. The floor for the music industry's transparency debate is open.